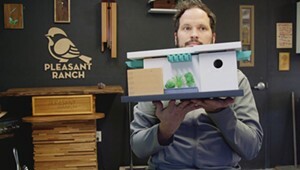 Thu., April 25, 7-8 p.m. at 7865 Main St.
Aiming to inspire people to create a more sustainable world through design and craft, Yestermorrow Design/Build School offers nearly 100 classes on topics such as woodworking and land and community planning. The Waitsfield center’s 2019 Speaker Series gives members of the public a chance to hear about related topics straight from experts. The latest installment features timber framer Seth Kelley and historic preservationist Jamie Duggan sharing their knowledge of New England architecture, as well as how materials, tools and culture have influenced both the creation and preservation of historic structures. at Yestermorrow Design/Build School in Waitsfield. Mad River Valley/Waterbury (map). Free. With her inventive guitar wizardry and uncompromising lyrics, the singer-songwriter pushes the boundaries of the folk-pop sound. at Williston Old Brick Church in Williston. Chittenden County (map). $15. Hannah Sanders grew up busking throughout Europe with her musical family. Ben Savage was a member of the popular English folk band the Willows. Put the two together, and you’ve got an acoustic duo known for a sound that, according to MOJO magazine, lulls listeners with “dreamy reveries, softly warm vocals [and] stirring guitar arrangements.” Bearing dobro, mountain dulcimer and guitar, the singers lift their voices ’round a single microphone in straightforward and timeless tunes from their 2016 album Before the Sun and 2018’s Awake. at University of Vermont Recital Hall in Burlington (map). $5-25. Hannah Sanders grew up busking throughout Europe with her musical family. Ben Savage was a member of the popular English folk band the Willows. Put the two together, and you’ve got an acoustic duo known for a sound that, according to MOJO magazine, lulls listeners with “dreamy reveries, softly warm vocals [and] stirring guitar arrangements.” Bearing dobro, mountain dulcimer and guitar, the singers lift their voices ’round a single microphone in straightforward and timeless tunes from their 2016 album Before the Sun and 2018’s Awake. at Highland Center for the Arts in Greensboro. Northeast Kingdom (map). $10-20. Expert Amy Olmsted leads horticultural fanatics on a stroll in search of seasonal blossoms. Meet in front of the museum. at Mount Independence State Historic Site in Orwell. Middlebury Area (map). $5; free for kids under 15. Cynthia Nixon graces the screen as 19th-century American poet Emily Dickinson. at Catamount Arts Center in St. Johnsbury. Northeast Kingdom (map). Free. Bibliophiles bring their appetites for cake and refreshments to a book launch for the local author's latest page-turner, The Invited. at Bear Pond Books (Montpelier) in Montpelier. Barre/Montpelier (map). Free. The Barre Historical Society pulls out all the stops to celebrate Primo Maggio, also known as May Day, an international day honoring workers. Three nights of festivities fill the former Socialist Labor Party Hall, starting with a talk by John Newbery Medal-winning children’s author and Vermont resident Katherine Paterson (pictured). Inspired by a photo of the sons and daughters of 20th-century textile workers on the party hall steps, Paterson wrote her 2008 young adult novel Bread and Roses, Too about a 1912 textile strike in Lawrence, Mass., told from the perspective of two children. A social hour and a traditional Italian dinner precede Paterson’s talk. Proceeds benefit the Socialist Labor Party Hall National Historic Landmark. at Old Labor Hall in Barre. Barre/Montpelier (map). $25. Heard on sharing true stories on "The Moth Radio Hour," this scholar and Holocaust survivor presents "A Survivor's Mission: Preserving Yiddish Language and Literature." Brian Perkins and the ONE Band perform Yiddish music. at Social Hall, Ohavi Zedek Synagogue in Burlington (map). Free.